This month is an "-ish" because I didn't wrap up March. It's such a nice month with its...well...there's nothing too grand about March (unless you celebrate a birth) but I hate to ignore it completely. Like I do cleaning my freezer. 1. Facts That Sound Like Huge Lies. #1 will sell you on watching this entire clip. 2. How I Met Your Mother. I spent 104 hours of my life watching this sit-com. I know this exact figure because of the website tiii.me. 90% of the time, I loved it, but the finale pummeled me. No words. TV critic Alan Sepinwall summed up my feelings perfectly. 3. The Office Time Machine. This is a website that allows you to plug in any year and view a brief compilation video of every single time the TV show The Office made a reference to something that happened then. Here's one of my favorite years, 1994, as an appetizer. 4. Vintage Easter Bunny. Buzzfeed collected 19 vintage Easter Bunny pics that will make your skin crawl. I could also show you three from my own Instagram feed. 5. Majestic. Kari Jobe released a live worship album recently. In finding the links for this list, I stopped to listen for the umpteenth time and stood up from my chair and sang like I was her twice. 6. 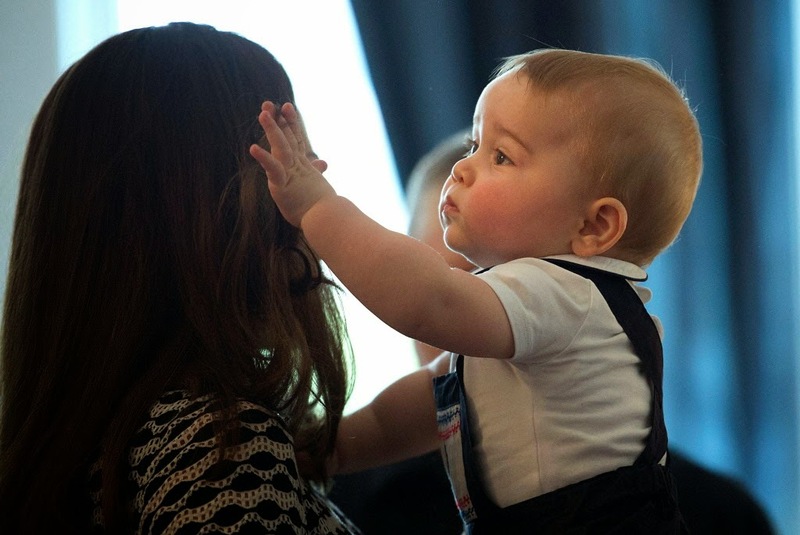 Prince George on Tour. I didn't know seeing Prince George down under would wreck me so. But for 3 weeks, I was captivated. I mean, I want to touch her hair too. He's as cuddly as a kitten and here's proof. 7. Kids React to Walkmans. I'm old. You're old. We're all old. 8. Stephen Colbert. I'm a huge fan of The Colbert Report and the guy behind the character - Stephen Colbert. One of the reasons is how often he talks about his faith. Relevant Magazine recently shared 6 Times Stephen Colbert Got Serious About Faith. 9. The Rosie Project. I devoured this book in 6 hours last month. Don Tillman is a genetics professor who creates a detailed questionnaire to help him find a wife. She will be punctual, logical and most definitely not a barmaid, a smoker, a drinker, or a late-arriver. Yet Rosie Jarman is all these things. Funny and heartwarming. 10. Helen Keller. Although Helen Keller was deaf and blind, she wrote two particularly moving letters. One to the New York Symphony Orchestra after "hearing" Beethoven's 9th and one to Dr. John Finley after "seeing" the view from the Empire State Building. We're all underachievers. 11. The Most Famous Book Set in Each State. Mental Floss compiled a list of all of the best-selling book sets in each state. My home state of Alabama, thankfully, picked To Kill a Mockingbird rather than a biography of Bear Bryant. My heart goes out to Arkansas. 12. Bitman Begins. My theory is there can never be enough Hemsworths. My favorite two gathered for this newest film adaptation. 13. Jen Hatmaker. I discovered Jen Hatmaker shortly after she published 7: An Experimental Mutiny Against Excess and I liked her almost immediately. Someone who had faith AND a sense of humor. A combination that is all too rare in my opinion. She wrote two blog posts recently that inspired me: Run Your Race and Where I Stand. What have you loved recently? What are your recs for books, movies, TV, websites, articles or cat videos?